There are no exercises for this section! In the exercise that follows, you will examine some of the many maps that we have produced for Nang Rong District, and some for Thailandas a country. Practice going beyond seeing just the basics shown to read all the information that each map has to offer. As you answer the questions, think about new, creative ways that you could use maps, beyond those shown here. You can find the maps for this exercise here. 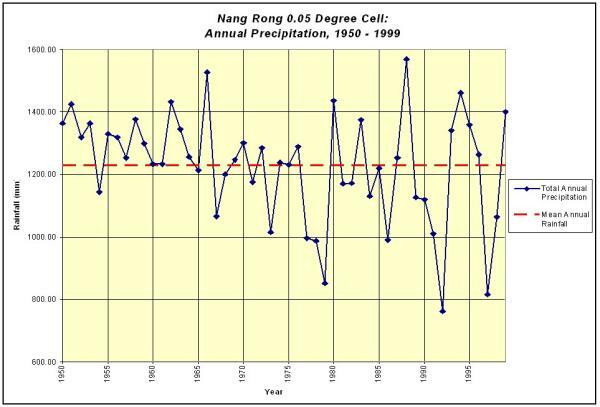 Have a look at the graph of rainfall in Nang Rong below and then answer the questions below. Rainfall is measured in what units? Time is measured in what units? What is the lowest recorded amount of rainfall in a year? In which year did it occur? What is the highest recorded amount of rainfall in a year? In which year did it occur? About how many years had above average rainfall? Below average? Are these two numbers about the same? Can you think of a reason why or why not? In this section, the point is made that one need not travel to a foreign land to encounter cultural differences. Describe an episode from your own life in which you encountered "cultural differences" of some sort. They could have occurred on a trip, or in your own home town, the key is that you and the other people involved didn't just disagree. Instead, you may have actually perceived the situation differently, used very different words to express yourself, or called upon experiences that you thought were shared but were not. Imagine you have been asked to host an exchange student from Thailand for a few days and you are the student's very first stop in your country. Write a short list of things that you think would be important to share with the student about your culture so that he or she can avoid embarrassing situations. To do this, try to image that you yourself are a foreign visitor in your own country. What things do people here take for granted that might seem strange to outsiders? For inspiration, you might try reading one of the articles listed in the section below. There are three different ways that we are going to learn more about the Nang Rong social surveys. First, we will look at the "numbers" to get a sense of the scope and size of the project. Second, we will view the actual questionnaires to learn more about the types of questions asked. Third, we will use the "dynamic statistics" portion of the website to see actual survey results. How many total individuals were surveyed in 1984? How many total individuals were surveyed in 2000? How big was the increase? Keep in mind that once a person enters our sample, they are always included in follow ups, whether they have migrated out of Nang Rong or are still living there. Given this, what do you make of the increase in the population we are studying over time? That is, do these number reflect the actual population living in Nang Rong at a given time precisely? How has the "median" or average age of survey respondents changed from 1984 to 2000? If you click on the link just below the median age labeled "age groups" you will see a more detailed graph of age groups in the population. How does this help explain the change in the average age? What happened to the average size of households (number including temporarily absent members) in Nang Rong over the 1980s and 1990s? Click on the link labeled "household assets" for each year. Describe the pattern you see over time in both the types of possessions and how widespread they are. Throughout this section, we have described both the difficulty of writing good questions, and the importance of responding to cultural difficulties and misunderstandings when they arise. You can see many actual examples of questions that have changed over time in response to our ever-improving understanding of Nang Rong and the people who live there by viewing the actual questionnaires used in our study. Under the "household information" section, question 8 asks about the household assets summarized on the "by the numbers" page. You see the same six assets shown on the graph. Based on your reading, why should we suspect that these responses are an incomplete picture? Compare questions #4 and #5 in the same section. Which do you think the researchers were more knowledgeable about before the survey was first conducted and why? As before, we will focus on just one of the three surveys, in this case 1984. Click on the link to the 1984 "dynamic statistics." Scroll down the list of "Numeric Variables" until you see the ten questions at the very bottom that begin with "member of..." These questions asked whether any members of a household participated in each type of group. Click on at least three and then describe the patterns of community involvement you see. Are there groups that are similar to those that exist in your own community? Are there any that seem unfamiliar? Does it seem like people in Nang Rong participate any more or less in such organizations than people in your own community? Given other changes that you have observed or read about so far, what do you think may have happened since 1984 to the number and types of groups available for people to join in Nang Rong? Choose another question off the list and describe the results, including the possible responses, the percentage choosing each response, and a statement about what this might mean. You may have to examine several choices before you find a question that has a yes/no or simple number (#) response. Responses like 9, 99, and 88 usually mean that the respondent did not answer the question, so you may ignore these if you like. First, note the date and season of each image. (Note that in these images, a fourth "season" is identified - the harvest, which falls between the wet and dry seasons. In this case, the term is used in same way as "tax season" or "hunting season," as opposed to the three major climatic seasons identified in section 3). What are the three most common land uses/colors? Describe the general trend you see in each of these three land uses - are they increasing, decreasing, or staying the same? Do the changes seem slow or fast given the dates of the images? What do you think explains the changes in land uses you just described? In answering, there are at least two major competing explanations, one having to do with the dates and one with the seasons when the images were taken. Describe these and any other explanations you can think of and be sure to indicate which one(s) you think best explains the actual changes you observed. Examine this aerial photograph. Describe some of the features that you can make out. Are there any objects in the photo that you cannot identify? Take your time and look carefully, as interpreting aerial photographs is a painstaking and difficult task. After doing this, identify the three land covers or land uses that seem most common in the photo (these need not be exactly from the list above). Open this page, and take a look at the four images near the bottom. You can read the text, if you like, but focus on the images. The two classified images on the right were created by a process very similar to what you were just doing with the 1994 air photo. A member of our team visually interpreted the whole extent of the image and grouped each region according to whether it appeared to be forest, open land (rice, etc. ), upland crops, urban, or water/wetlands. This process was aided by much larger prints of the images, magnifying lenses, and intensive training to recognize important features, but even in the small images on the left, you can see patterns similar to those on the right. Are there any regions you can find that seem to match up better or worse than others? Where are they? Now it is your turn to try some actual classification. We will go back to the 1994 image again. On the image below (the same as here), there are eight regions labeled A through H. Inspect these and make your best guess as to what it is you are seeing. If you are thinking, "how do I know what that little black dot or grey splotch is?" you are feeling some of the same frustration that our team members have felt. Just like you, we do not have the answers. The farther back in time we go (and remember that images exist from as early as 1954), the harder it gets because we cannot even visit the place today to see if any of the land cover still exists. Make your best guesses and then compare your responses to those of your classmates. Assuming that you must decide on one and only one classification for each region, how will you handle disagreements? Done early? Try your skills out on the image in section 9. 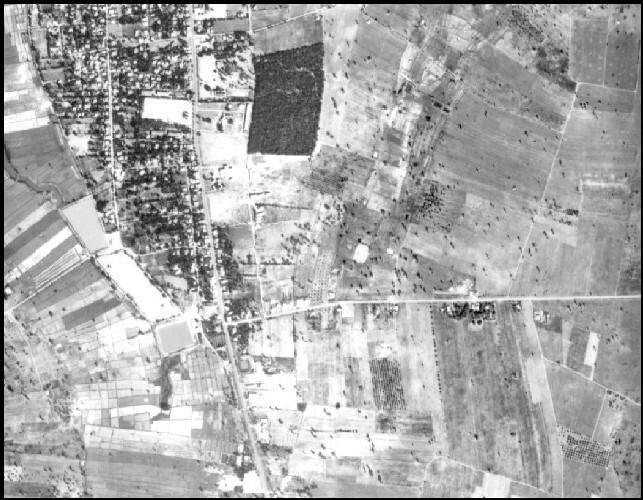 Can you detect the following features: bunds, individual rice paddies, trees, ponds, homes, roads? If you aren't sure what some of these are, have another look at sections 2 and 3. Suppose you wanted to study the impact of humans on the environment they inhabit somewhere in your home country. Some of the potential challenges and concerns might be similar to those found in Nang Rong, but many will be quite different. Pick one of the following research questions and design a strategy (or more than one) for linking up the people in a study with the places they impact. Your strategy should adhere to some basic principles: 1.) it must be ethical, legal, and not be burdensome to the volunteers in your study 2.) it must link people to places in a precise, or spatially explicit, way 3.) it must not be outrageously expensive. The most important factor impacting the availability of prime habitat for a particular species of shore-dwelling bird is apparently human activity, including the building of beach homes very close to the shoreline. To determine the impact on a particular nesting site for a local study, you would like to find all of the people living in such houses on a 1-mile stretch of the coast and survey them about the way they use their land and their knowledge of the impact they may be having. The problem is that over 90% of the owners live somewhere else during part of the year. A second problem is that the owners often rent out their homes to others who have an equal potential of impacting the bird. You have two sources of information that may help: satellite images of the beachfront showing the addition of homes over time and a list of the local beachfront association, which is comprised of local homeowners, business owners, and other citizens concerned with the preservation of the beach. How would you go about linking up the people you want to study to the places they affect? What will your biggest challenge be? The Emerald Ash Borer is a tiny insect that is responsible for killing a certain species of tree in some regions of the <?xml:namespace prefix = st1 ns = "urn:schemas-microsoft-com:office:smarttags" />United States and Canada. The Ash Borer is not very mobile by itself, and so researchers have come to believe that one of the major ways it invades new territory is by hitching a ride in firewood and other wood products transported from place to place by humans. Suppose that the Ash Borer has so far appeared in only a few isolated locations in your county, and you and other members of your class have set out to study its movement in greater detail. You have remotely sensed images of all of the forests in an infected county, and can even tell from them where the trees most likely to be under attack by the Ash Borer. You also have lists of all the persons who have obtained licenses to harvest wood products of any kind in the county. The problem is that many different people use the woods for a variety of purposes, and unless you capture all of these, you will quite likely fail to understand how the Ash Borer spreads, and thus fail to contain it. How would you go about linking up the people who acquire forest products in the county with the forests they affect? What will your biggest challenge be? Your city has a problem. Pets are especially adored where you live, and many people own dogs, cats, and other animals. The problem is that these owners ignore the city ordnances about cleaning up after their pets and as a result, many of the areas on and around the city's sidewalks and parks have become unsightly, to say the least. You have volunteered, along with classmates, to study a particularly "perilous" stretch of the main street including a park to learn more about the problem before the city develops a new set of rules. You have a list of all owners of licensed pets in the town and their addresses, as well as a map showing the location of every "infraction" from last month (fortunately the last group of volunteers completed this rather unpleasant task). Some of the difficulties in linking up the pet owners to their impact on the local ecosystem is that not all pet owners walk their animals, some pick up after their pets and some do not, while some pets are "repeat offenders". There are far too many pets, and far too many hours in the day to either contact all of the owners or police the streets constantly. Your task is to find a way to contact and speak with as many known violators as possible, but you should try not to speak with too many conscientious pet owners, as these people then tend to complain to the city council. How would you go about linking up the rogue pet owners with the worst areas for pets leaving their "calling cards" in town? What will your biggest challenge be? It is important that you really understand what a GIS really is and how it works before you move on. In the exercises that follow, you will be asked to visit some of the many online applications that use GIS technology and "play around" with the features. Some may already be familiar to you, while others may be quite novel. We'll start out with a simple GIS that many of you may already be familiar with. Use Mapquest to find your own school or home by typing in the address on the start page. You may have to try more than one address to find one that works. Once you are looking at a map of your chosen place, click on the tab in the upper right of the map that says "aerial image". Also be sure that "street labels" is still checked. When you have done this, you will be looking at a basic GIS. It has layers, like a cake: the base map created from satellite images, the streets overlaid onto that, and possible street name or other features on top of it all. And unlike a traditional paper map, every object you see is precisely georeferenced, meaning that no matter what scale you zoom in or out to, and how you choose to look at it, every object maintains its exact spatial relationship to other objects. Try out the National Atlas. This program allows you to zoom in on the United States and view many different data layers one-at-a-time or all together. Play around with the controls at the right until you understand how to display different layers by checking the boxes next to them and how to show and hide different choices of layers. Zoom in and center on your state (there is a box near the top that lest you do this in one step). Check the boxes to add a few of the following: a.) cities and towns, b.) counties, c.) roads, and d.) streams and waterbodies. Click on the button labeled "redraw map" if these layers do not appear right away. Keep your hometown near the center as you do so. Now add another one or two data layers that seem interesting to you to the map. If a given layer does not apply to your state (for example, if you clicked on "superfund sites" and there were none in your state) choose a couple more. Notice how some of the layers combine together well, while others seem to "cover up" the layers beneath. Describe the data layers you have added (you can switch to "Map Key" at any time to learn about the symbols in a layer once it has been added). What was the original source of the data? Notice how many different kinds of information are available, all of the spatially referenced. Zoom in on your town or city, paying attention to what happens to the data layers and amount of detail that is visible as you zoom. When you get down to the level of your city, make sure the map is still centered. See if you can tell a "story" with your map - perhaps by showing two or more layers that you think might be related at the same time. Print out the map you made when you are done. Earlier, we noted that answering questions about the proximity of villages to water would require us to "zoom in" a bit to get a clearer picture. In the exercise that follows, we will do just that. The figure below shows a region of Nang Rong District that contains over a dozen villages, represented by the red dots. Surrounding each village, and giving it a shaggy appearance are lines that connect the center of the village to every parcel of land used by the families living there. The blue areas represent land that would likely be flooded during the wet season when rice is grown. Choose several villages and examine their location. Are they on dry land or in "inundated areas"? What about the space just next to the villages? Does this tend to be mostly land or flooded areas? Now look at the lines connecting villages to agricultural parcels. Where are most of the parcels found, that is do the lines stop on dry land or flooded land? What would you guess is being grown in the wetland parcels? The dryland parcels? Using the several different explanations proposed in the text of this section, along with your own imagination, write a short paragraph that describes the motivations of settlers in choosing the location for villages. What other data "layers" would you like to see on this map? That is, what other factors do you think might have been important to villagers settling in Nang Rong, and why? Of the various research tools and techniques described in earlier sections, which can you see being used to produce this map, and how were they used? If the trend shown in the rainfall graph above were to continue, what would it mean for the farmers and other people of Nang Rong District? More specifically, what might happen to the present villages if rainfall levels were to increase or decrease substantially? What could happen to the staple crop, rice, if rainfall levels became even less predictable, and more extreme, than they are now? How might people adapt to these changes? Which groups and individuals in the local communities of Nang Rong are likely to be hardest hit by a continuation of the trend seen above, that is, who will have the hardest time adapting? What about at the national or global scale, who will be hardest hit there? We noted in the text that deforestation may have a major impact on global climate change by causing the release of large amounts of carbon dioxide previously stored in the woody parts of trees and shrubs. There is another way that deforestation may bring about changes in climate. By changing the quality of plantlife on the earth's surface (from trees to crops, for example) humans alter the amount of moisture held near the surface of the earth, wind patterns, and the speed at which moisture returns to the sea (where most water vapor in the atmosphere originates). These represent just a few of the many long-term considerations one must take into account when assessing the impacts of humans on their environment. It also shows that even in cases where the impact seems obvious - the loss of trees - the actual consequences may be more numerous and widespread than realized. What are some other impacts of land cover change that follow this pattern? Describe some other area of human life or the environment that is indirectly affected by changes in land cover through one or more intermediate steps. How would you go about designing a survey or other research project to obtain evidence of the impacts you described above?